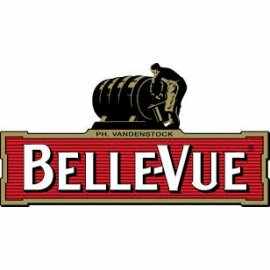 The Belle-Vue Brewery is located in Sint-Pieters-Leeuw. The founder (1913) of the current brewery was Philemon Vanden Stock but yet in the Middle Ages Gueze was brewed in the Zenne valley. Specific to Geuze Beers is the use of 30% wheat, spontaneous fermentation and the blending of young and old Lambic Beers. The typical sour taste of the beers is due to the spontaneous fermentation of the yeast cells that are found in the air around the Zenne valley. Lambic is the basic beer that matures in oak barrels. After 1 year it is called a young Lambic. This is the base to brew the Belle-Vue Kriek, the Belle-Vue Framboise and the Belle-Vue Gueze beers.